Since 2014, CARTHA has provided a platform for critical thinking on architecture aiming to bridge the gap between theoretical and practical approaches to contemporary architecture. Each year, CARTHA initiates research and publishes four issues on a topic in its online magazine, which are then brought together in an annual book. In 2016, CARTHA collaborated with the German Pavilion at the International Architecture Exhibition of the 2016 Venice Biennale. 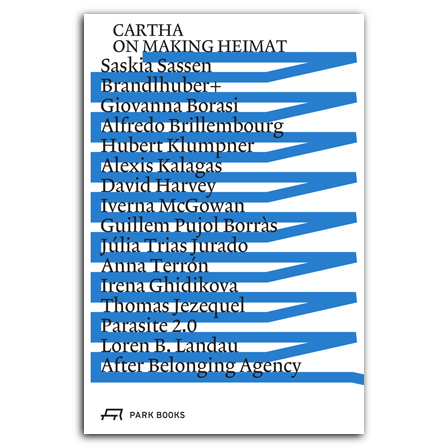 Titled Making Heimat: Germany, Arrival Country, the German Pavilion explored the challenges and potential of the recent influx of refugees to Germany has posed for architecture and urban design, and contributions to CARTHA further reflect on this topic. The book features interviews with Giovanna Borasi of the Canadian Centre for Architecture, Montreal; David Harvey of the Graduate Center, CUNY; Loren B. Landau of Wits University in Johannesburg; Iverna McGowan of Amnesty International; Saskia Sassen of Columbia University; and Anna Terrón of United Nations University, Barcelona. Further contributors include After Belonging Agency; Arno Brandlhuber, Brandlhuber+; Alfredo Brillembourg, Humbert Klumpner, and Alexis Kalagas; Guillem Pujol Borràs and Júlia Trias Jurado; Irena Ghidikova; Thomas Jezequel; and Parasite 2.0. Foreword by Oliver Elser, Peter Cachola Schmal, and Anna Scheuermann.